Hello, everyone. I have a lidar court date coming up. I would appreciate some help with the defense and some tips on how to proceed. coded notes by the officer. 2. A typed version of any hand written notes. 3. Both sides of the officerÃƒÂ¢Ã‚â‚¬Ã‚â„¢s copy of the Ticket. 4. Information about any speed monitoring devices used in the alleged offence. monitoring device, or speed estimation device. 7. A copy of the operatorÃƒÂ¢Ã‚â‚¬Ã‚â„¢s manual for said speed-monitoring device. 9. And any other document that the Crown, or CrownÃƒÂ¢Ã‚â‚¬Ã‚â„¢s witness, may rely on at trial. I did not receive any certifications or traing information except in the first document where it says "August 2014". Is it reasonable to ask he shows a certification document. If he does not have it, can I question it's validity and the fact that he can't prove he was trained for that exact unit. The second document I assume it is a confirmation that that the unit passed testing at the end of the shift. That is at 5:20PM. In the first document the unit was tested at 9:30AM. 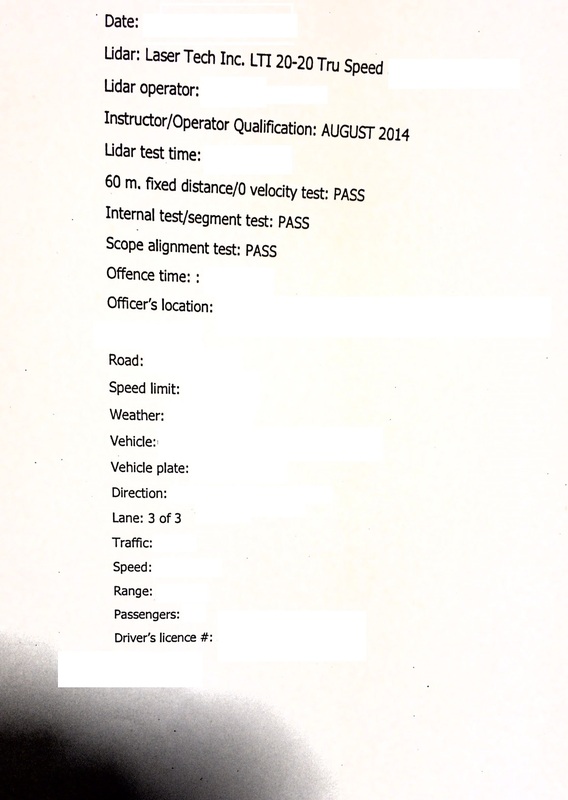 The second test just says PASS, there is no detailed information on what tests were performed. Also isn't it a bit too long before tests? I am sure the officer must have had lunch or moved. How often should the unit be tested? Are there any guidelines/case law for the time frame that a unit must be tested after a speed enforcement stop? I plan to question his testing procedure step by step. If he omit steps it should help me, no? What else can I use for defense? One more thing, what exactly are the typed pages I received? Are those the officers notes or they are the officers notes transcript? Who typed them? I did not get any handwritten notes. Is there any case law regarding that statement? Any idea what those two typed pages are? They are not signed. Are the notes required to be signed? Its hard to say what the pages are unless you tell us what they say .. typically notes aren't signed. It could be notes if is a typed page from an eticket , notes can also be handwritten from the back of the offence notice that the officer submits.